If there is something that makes humans human, it is our ability, no, our desire to find patterns. To make connections. To tell stories. It is something we are very good at, such that clouds become herds of horses, smatterings of stars become legendary heroes, and a handful of stats indicate the economy is going great/going to hell in a handbasket due to the high ethics/moral bankruptcy of those involved. And now, the Superb Owl. Championship game of the NFL. And that is not just enough, of course. It must have deeper meaning than merely men contending for a prize, and as a result, we see the rise of the Narrative. This year, the game is between my hometown Seattle Seahawks and the Peyton Mannings. Yes, it really is the Denver Broncos, but despite the fact that Denver has a plethora of excellent players (none of whom come to mind at the moment), every bit of coverage is going to be about the legendary quarterback who is going to a Superbowl representing a completely different city than his last time. In fact, we can use a Manning-base Bechdel test here - You have to find an article that a) is about the Broncos, b) is about a player who is not Manning, and c) does not mention Manning and that player's relationship to Manning. Have fun. Note that even our local weather expert, Cliff Mass, falls prey to this - comparing how well the Seahawks as a team do in aggregate against how well Peyton Manning does in sub-zero weather. Sigh. On the other side, the Seahawk articles will follow the traditional overlapping trinities found at this time of year. One player is chosen from the following categories - Quarterback, Running Back/Receiver, and Defender. There will be other players who are very, very good at their jobs, but we look at those positions, and then overlay the approved personality traits - The Cute One, The Loud One, and the Tough One. Think I'm kidding? Look no further than the championship Steelers of my youth, with Bradshaw (Quarterback, Loud), Franco Harris (Cute (well, suave), Receiver), and Mean Joe Greene (Tough, Defender). It is a pattern, one the Narrative thrives upon. And if you have to talk about a fourth player, you talk about the kicker. The kicker is the Ringo of the holy trinity, and doesn't need to have a singifying trait. So, for the 'Hawks, we have Wilson (Cute, Quarterback), Sherman (Loud, Defender), and Lynch (Tough, Running Back). We have a lot of extremely talents players (Kearse, Baldwin, Tate and the holy ghost of Harbin who will player a full quarter sometime this season), but those first three will be the stories. Along with the "character" of the team. See, the last time Seattle went to the Superbowl (against Pittsburgh), the team was considered too NICE to be there. Seattle was a bunch of reasonable nerds with pocket protectors that would be mugged by the smashmouth, down and dirty, hard working type of football that Pittsburgh played. And indeed, that narrative played into a couple questionable calls that Seattle remembers bitterly to this day (Not that this seeking of redemption will be part of the Narrative - the Narrative does not like to examine the mistakes of the Previous Narratives). This time, the Narrative is shaping up the other way. Seattle is the black hats. We're the bad boys, the loud mouths, the chippy trash-talkers. The coach looks the other way for violations and the team has been heavily penalized. They are the scrapyard dogs, the fans are loud and obnoxious, they play nasty. They are almost ... Oakland. This is an 180 degree flip from the last time. But don't ask the Narrative about this - the Narrative moves in its own, private ways. So look for these things in the next week as the hype engines fire up, and the sports folk talk about Russel Wilson's boyish good look and how uncouth our team is. And most of all, the Narrative will be how it will all be for naught as Peyton Manning and his team, the Peyton Mannings, cruise to victory. Until they don't. A pop-up, in foodie terms, is a short-term restaurant set up with a clientele notified by twitter, rumor, and social media. In short, a foodie rave. It gives chefs a chance to experiment, young talent to get experience and (the cynic in me is strong these days) a way of sidestepping unions, reviewers, and local health inspectors. One week there is a private supper club in that storefront, the next week it is back to being urban blight. So too does the Political Desk suddenly shows up, makes a couple announcements, then beats a hasty retreat to its lair. But there are things that need to be noted. First off, in the Puget Sound area, we have some (very) local elections coming up. Didn't we just have a bunch of these? Well yeah, but these are for school levies (read, taxes which have specific goals). In the case of Kent, where Grubb Street is now situated, these levies are to renew expiring levies to fund schools, maintain educational programs (like bands) and provide equipment (Really? What happened to those used Mac Pluses we gave you twenty years ago?). Naturally, I vote YES on such matters, since I tend to like to have children around who are slightly less dumb and more cultured than the American average, but my cynical heart notes that we get to vote on spending money on our childrens' future, but no one really asks us when we open our pants (and by pants I mean coffers) to fluff Boeing. Second off, there has been a change in the Kent City Council. Previously, you will remember that one of the candidates for office was charges with stealing nearly $300,000 from his own mother. This candidate, Ken Sharp, won the position, though just barely. This blog did not endorse Mr. Sharp, noting, among other things, that even if these charges were found untrue, he would be a wee bit distracted. Two weeks after being sworn in, Mr. Sharp has stepped down, as the charges (seven counts of first-degree theft) would be, in his words, a distraction. Yes, we called it here. So, what now? Kent needs its seventh member of council. Previously, as when there was a death on the council, the council will consider candidates and appoint someone for the term (so no, you don't have to vote on this - I know that's a relief). But, this is happening relatively quickly. Like by end of day on Feb 7. So if you happen to live in Kent, have experience in civic, professional or volunteer organizations, have a high tolerance for bureaucratic organizations, and want a part time job that pays around $13K, here's the link to apply. Per the Kent Reporter, three candidates have already applied, all individuals who have lost in the previous election. Bailey Stober was narrowly defeated by Mr. Sharp, and would be a solid choice. However ALSO as noted in this blog, he's had some problems getting his election finance records in order, and is being investigated by the Public Disclosure Commission (and the cynic within me notes that this investigation was announced hot on the heels of Mr. Sharp's resignation). Deborah Raplee was a write-in candidate in the Stober-Sharp race, and a previous member of council, which gives her the probable edge (oh cynical, cynical heart). Wade Schwartz lost in another race, and were I to put my two cents in, be my choice. But I don't get that chance because, um, democracy. If only there was some OTHER election happening right now that we could hook this to, but such is the nature of things. And with that, the pop-up closes down, before the fire marshals show up. More later. 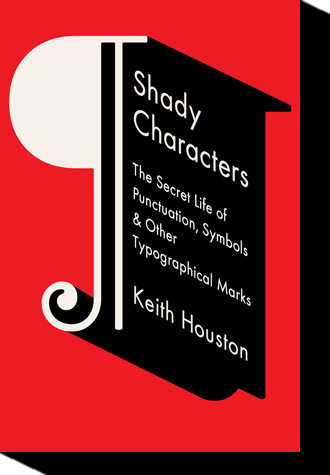 Shady Characters: The Secret Life of Punctuation, Symbols & Other Typographical Marks by Keith Houston, W.W.Norton & Company. The pilcrow. The octothorpe. The manicule. No, these are not creatures rejected from the 5th Edition Monstrous Manual, but rather occupants of font libraries, keyboards, old manuscripts, and software programs. Stuff that you may have seen but didn't know it had a name. These creations are the supporting cast of the alphabet, those symbols that did not make the cut for traditional A to Zed, but have survived in a odd symbiotic relationship, a typographic twilight zone, their fortunes rising and falling over time. The pilcrow is the paragraph marker. Yeah, the one that looks like a backwards "P" mated with a "J" and shows up invisibly in your files to mark the end of the paragraph. The manicule is the old-timey hand that points at stuff and reminds you of the signs from a hundred years ago. The octothorpe is what us old folks used to call the "pound-sign" or the "numbers-sign" but you kids today call the hashtag. Shady Characters is full of them, along with the dash, the hyphen, the quotation marks, the @ sign, the asterisk, and the dagger (also called an obelisk, which makes me wonder about the true origins of Asterix et Obelix). And it is a cool guided tour through the lower planes of typography. What I like about this book (and about books of this type) is that it is committed to following the development of a concept through time, and showing that the path is neither straight nor narrow. Our typography, like just about everything else, is a rugby scrum of competing concepts which are introduced, flourish, battle it out, are forgotten, and then show up in another context entirely,. Houston's material loops back through history several times, dealing with the Library of Alexandria, Roman (upper case), Carolingian Minuscule (lower case), glossaries, monks, movable type, linotype machines, unicode, and of course in the Internet. Things which work well for one domain may not make the jump to the next, and concepts which were left fallow suddenly see a renewed existence (your pilcrow, replaced by the empty tab at the start of the paragraph, now lurks in the bowels of that copy of Microsoft Word). Houston keeps the story moving forward, while footnoting extensively. The book itself in 250 pages long, with an additional 70 pages of notes as every line demands a reference to its origins. It is that amazing combination of deeply researched and accessible at the same time. The piece that I come away with is how we have treated text differently over time. In the time of the Greeks, writing was a memory device, where you knew the story and the text existed (often without punctuation or vowels, or spaces between words) as a prompt. In the time of illuminated manuscripts, the glossed notations took a life of their own, such that a book was expected to be marked up, corrected, and evolved. Book ownership indicated ability and willingness to argue with it. The tyranny of cold type forced another change and established the arbiters of what would and would not make it into typeface. And so to the present, where the Internet has produced its own solution to the often-attempted but never-delivered sarcasm symbol. If you have a love of punctuation and iconography, this is a great book to move through, keeping to its various subjects but throwing open doors to new concepts and parts of history mostly forgotten. 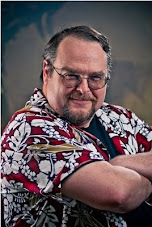 Keith Houston maintains his own blog where he continues his research as well a promoting the text. Both book and blog are worth checking out.